it's gonna be a long day inside Disneyland today! So , first thing first , let's filled up our stomach first! 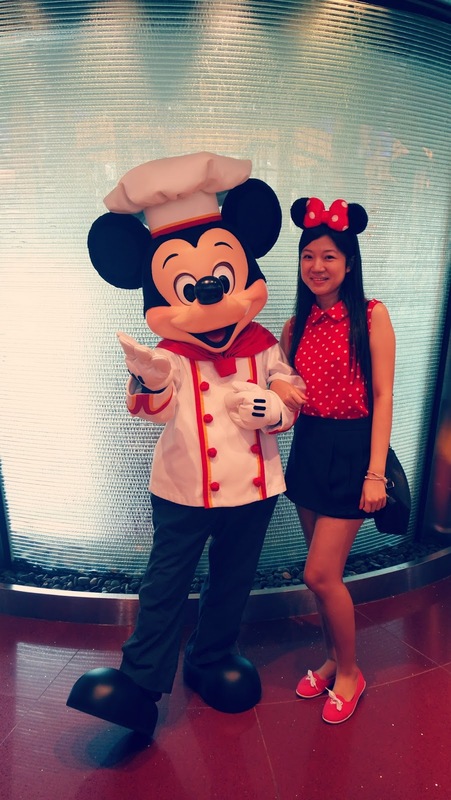 Anyway , my target is Chef Mickey Cafe! i ran fast to my target! and i saw Chef Mickey standing at front of the cafe to welcome all his guests! of course , we are one his guest of honor! ehem , well, it's a themed cafe and it's all about Mickey lor......! The variety selection of foods! Mickey Cafe is a place loaded with all the cuteness! all the foods prepared by Chef Mickey was so details and delicate! firstly , the cup and the plate are strictly follow the theme! feeling young when you dining here! Picture speaks a thousand words here! love the shui gao (dumpling) and xiao long bao very much! The Mickey Waffle is must try! Hot from the pan and crispy too! Okay, im full , as you can see , i ate a lot here! And yup, i didn't took my lunch after this heavy breakfast! i was out of control once i entered the magical land! early booking is required as it is always FULL HOUSE!